Listening to Taking Back Sunday as an emo kid in 2006 was like hooking the embodiment of your misplaced rage into your veins. If you didn't roar the chorus of "MakeDamnSure" in your bedroom while trying to aggressively apply kohl eyeliner then were you ever really an emo kid? But things change, and in the intervening ten years or so since then TBS have gone through line-up changes, sound changes, and four studio albums. The latest of these albums, Tidal Wave, is a definitive rock album that is hook-laden and cinematic, filled with powerful riffs and affecting lyrics. 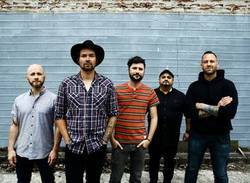 John Nolan, the band's lead guitarist and co-vocalist alongside Adam Lazzara, spoke to SPB about his upcoming benefit compilation album, the process of piecing Tidal Wave together and the possibility of a TBS acoustic record. Scene Point Blank: You're releasing a compilation album with a number of bands to raise funds for ACLU in the wake of the Trump presidency, do you think having Trump in power will mobilise more American musicians to become political? John Nolan: Yeah, I do. I think a lot of musicians have been politically aware for a long time but kind of quiet about it. What I'm seeing is more of them being unafraid to speak up and take some more public action. Scene Point Blank: The compilation is comprised of unreleased and rare music from bands such as Anti-Flag, Frank Iero, and Dave Hause. What sort of sound can we expect from Music For Everyone? John Nolan: The songs are still being submitted so it's hard to say. I think there's going to be a blend of punk rock-type stuff to some pretty quiet, acoustic stuff. Scene Point Blank: Tidal Wave was the first album you wrote while you were recording. What impact did this have on the album overall and the dynamic of the band? John Nolan: It gave us the opportunity to listen back immediately as the songs developed. We'd work on a song for awhile and get solid takes, and then be able to sit and listen to them in the control room and analyse what we liked and what we didn't. In the past we'd have a rough demo of a song, and then a few months later, a better demo of the song, and then a few months after that we'd go in to record the finished song. I think this time we streamlined the process. Scene Point Blank: "Homecoming" was recorded multiple times. Were there any other songs on the album where the early demo is a million miles away from the finished track? John Nolan: There are a few. Even with "Homecoming" the basic idea is there in the original demo. It's not like you'd hear the original version and it would be unrecognisable. Different things about the structure and arrangement of the song kept changing though. It's almost like the demo was the child version of the song and the final version was the adult. That kind of process happened on a few of the songs. Scene Point Blank: Which track did you find easiest to write? John Nolan: I would say "Tidal Wave" came easiest. It started when I had this rough idea on an acoustic guitar. I played it for the band and Mark [O'Connell, drummer] said, "We should turn that into a Ramones type song." I worked on it some more, and then the band worked on it with Mark's suggestion in mind and the first version we played of it was pretty much what you hear on the album. Scene Point Blank: In the short film about the making of the album I saw some of the band members' children in the studio. Do you ever use your children as a sounding board for your songs? John Nolan: My kids are still a bit too young to use as a sounding board. My son is four and he generally likes anything I play him. I think as he gets older he'll get more opinionated and it'll be interesting to talk to him about what he thinks of different songs. Adam [Lazzara, singer] and Ed [Reyes, rhythm guitarist]'s kids are older and they may be starting to have that type of experience. Scene Point Blank: What was your personal highlight during the recording of Tidal Wave? John Nolan: There were a lot of great moments during the recording, it's hard to single one out. There was just an overall sense that we reached a new level creatively. There were different moments personally that stood out for me but it's hard to single them out. Scene Point Blank: This album is definitively a rock album, and the title track is a curveball for anyone who pigeon-holed TBS as an emo band. With Happiness Is and Tidal Wave, was there a conscious desire to get away from the "emo" label? John Nolan: There was a desire to make the kind of album that we'd enjoy listening to. We didn't want to try too hard to move away from anything we'd done in the past or move towards some new idea. It was just about trying to listen back to what we were making and saying, "Do I enjoy listening to this or not?" Scene Point Blank: You have previously said that writing songs for yourselves began with Happiness Is. Did you feel restricted in your work prior to Happiness Is and Tidal Wave? John Nolan: With the Self Titled album we were learning to work together again, I don't think we knew what we were aiming for other than to make a good record. With Happiness Is we had become aware of what people expected from us and we were actively trying to ignore that and focus on what we wanted. With Tidal Wave, the goal was to not think about any of it and just listen to the music and think about our opinion of it. Scene Point Blank: Lastly, you've already released a live acoustic album, and most of your albums have acoustic songs ("Divine Intervention" and "I Felt It Too" come to mind). Have you ever thought of doing a full-blown acoustic studio album? John Nolan: I don't think we'd ever do a full acoustic album. Maybe an acoustic EP? Words by Aideen on March 19, 2017, 8:52 a.m.
Posted by Aideen on March 19, 2017, 8:52 a.m.
Posted Nov. 18, 2014, 2:13 p.m.
Posted June 8, 2014, 10:01 a.m. 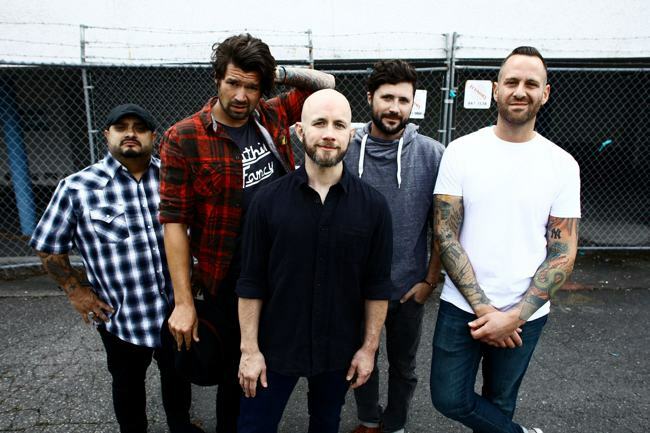 Taking Back Sunday have announced a co-headlining tour with The Used and dates at all three summer Riot Fests this year. The band released Happiness earlier this year. Posted June 11, 2015, 6:09 p.m.
Posted April 4, 2014, 8:55 p.m.
Posted Oct. 16, 2010, 11:09 a.m.